There’s a desirable sweet spot in every big performer’s career where they finally have a large number of hits to fill out a two-hour show, a compelling enough current album to sustain audience interest between the hits, and the appropriate level of earned confidence to take some bold risks in staging and presentation. special effects and a backing band that shook the cheap seats on the more rocking numbers. Opening with “Good Girl”, Underwood tore through an opening section which included a healthy mix of hits from all four of her studio albums. But the show didn’t hit its stride until the second section, when she surprised the audience with the appearance of a choir from local elementary school P.S. 22. They supported her in a touching rendition of “So Small” that lived up to its name, stripping the bombast from the studio recording and letting the lyric shine over the sweet harmonies that only bewilderingly talented tots can produce in unison. The arena felt as intimate as a sitting room as she sang “Temporary Home”, which seemed to have her on the verge of tears by the third verse. After a few more hits, the show peaked with an ingenious third act that had Underwood floating above the audience on a moving platform. Why was it ingenious? It solved a few arena show dilemmas at once, keeping the entire audience riveted while the artist sang unfamiliar album cuts. At the point of the set list usually designed for bathroom breaks, Underwood had the entire arena on their feet, cheekily waving to and interacting with the audience members all around her, and even those directly under her. These are the benefits of a clear plexiglass floor, you see. At times, the staging was a bit too ambitious. The video screens that were used so effectively for visual songs like “Two Black Cadillacs” were a glaring distraction for much of the show, with random patterns that looked more like late nineties Windows screen savers than anything else. Transitional interludes featured some interesting animation, but it was interrupted by glamour shots of Underwood, as if they were afraid we’d forget about her while she was changing costumes backstage. But the opening and closing projections centered around “Blown Away” were executed brilliantly, among the best I’ve seen in an arena show. Vocally, Underwood was nearly flawless, never missing a note but occasionally losing her breath while she enthusiastically engaged the audience. At times, she seemed a little overwhelmed by her band, most notably during a painfully loud cover of Aerosmith’s “Sweet Emotion.” When the arrangements were slower or simpler, with her voice accompanied by only a handful of instruments, she sounded better than I’ve ever heard a powerhouse vocalist sound in concert. When you combine her precision with the very few liberties the band took with the studio arrangements, and you could be forgiven for thinking you were listening to an actual studio recording. She really is that good. She somehow elevated the fan favorite “I Know You Won’t” to staggering new heights, and that’s a song that seemed superhuman even as a studio recording. I repeat, she really is that good. But most impressive was when she revisited older tracks like “Jesus, Take the Wheel” and “Wasted”, and actually improved on them, showing how much she has grown in interpretive skill and vocal nuance since the beginning of her career. Those hits from the first album, along with the pre-encore closer “Before He Cheats”, where absolutely the biggest crowd-pleasers, giving anecdotal evidence to the theory that Underwood’s greatest competition has been herself. Those early hits have overshadowed everything she’s done since, successful as she’s been. But I discovered something when she closed the show with “Blown Away.” The audience roared at the opening notes, after having been teased mercilessly with clips from the video all night. There was more energy and excitement during that performance than at any other moment. It’s her first career record in years. Underwood was classy and thoroughly charming throughout. That light shines through even when her material’s at its darkest. It was a minor annoyance for me that I was surrounded by tweens, teens, and twenty-somethings that stood for the whole show and sang along with far too many songs. But seeing a whole row of those tweens in Carrie Underwood t-shirts, clearly at their first big concert and hanging on every word that their idol sang, I was struck with a deep appreciation for this artist. I’ve always been grateful that she respected the genre’s traditions and institutions, but I’m always worried about preserving the genre’s past. She’s also securing its future, as perhaps the only artist in country music history who can pack an arena that is equal parts tween, young adult, and the rest of us. In that sense, she just might be the most significant country artist of her time, in addition to being the flat-out best singer. I missed the first couple of songs by opening act Hunter Hayes, but judging by the piercing adolescent screams that permeated the arena, he won’t be an opening act for much longer. I must say that he’s remarkably talented. I expected the country arrangements and the solid vocals, but his prowess with both the guitar and the piano took me by surprise. He’s somewhere between Keith Urban without the gravitas and Gary LeVox without the nasal drip. Hopefully, he’ll keep honing his songwriting skills and his audience will stick around as he develops. He’s got more promise than most of his contemporaries. Single Review: Randy Houser, "How Country Feels"
It was a minor annoyance for me that I was surrounded by tweens, teens, and twenty-somethings that stood for the whole show and sang along with far too many songs. I’ve got the itch to see her again now that she’s out working her solid new Blown Away album, which is my favorite Underwood album to date. Her current show sounds like a good’n. Great read, Kevin! I’m going see her on Saturday, she’ll have an additional opening act, Kira Isabella, so I’m hoping to get there early. I’m also hoping she’ll add “Wine After Whiskey” to her set list just for our show lol. Otherwise nice set list and I’m hoping I love the show as much as you did Kevin. Kevin, how was the crowd reaction to One Way Ticket? I have been fervently praying that they won’t choose that song as a single lol, but I’m curious if the crowd liked it. Thanks. “One Way Ticket” was a huge crowd pleaser. It works well live. She was just here recently, and for some reason I didn’t feel like it was a priority to see the show, even though I like both her and Hunter. Sounds like that was a mistake. Hopefully the CMAs take notice, but considering she’s never gotten in EOTY there and the ACMs snubbed her this year, I won’t hold my breath. 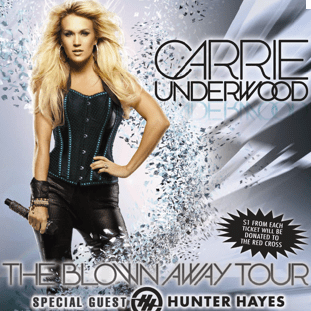 This year, the entire Blown Away Tour has been held in the CMA eligibility period, unlike the Play On Tour, where only half was held in the time period. It makes a bigger difference, but it won’t get Carrie the nod. Nothing will, so banking on her to get one is just spirit-crushing at this point.